ONLYOFFICE is a free, open source software that enables teams to manage projects, customer relations and documents in one place. Though Ubuntu is the most well-known Linux distribution, we don't want other distributions users to feel left out in the cold. This guide will show what steps to take to install ONLYOFFICE collaborative system on Red Hat/CentOS. The components found in the system repository will be installed automatically at ONLYOFFICE installation using the yum install command. If some of these components are missing, follow the instructions from their official websites. Step 2. Add the yum ONLYOFFICE repository. Before you start ONLYOFFICE for the first time it is necessary to create the database and configure connection to it. It will interactively ask you to enter the MySQL connection parameters, create the database, update configuration files and run all services. Please, note: the script does not create users for the database and does not change passwords for existing users. Installing MySQL database... Warning: Using a password on the command line interface can be insecure. Enter a password and specify the email address you will use to access your ONLYOFFICE the next time. Done! You can start working! Tip 1. ONLYOFFICE uses Mono v. 3.2 or later, to install it checkout the official instructions. If it is installed to find out your current version, execute the following command: mono --version. Tip 2. To install the latest version of nginx, follow the official instructions. Tip 3. ONLYOFFICE requires MySQL version 5.6 or later. To install it on your machine, refer to the official instructions. Tip 4. 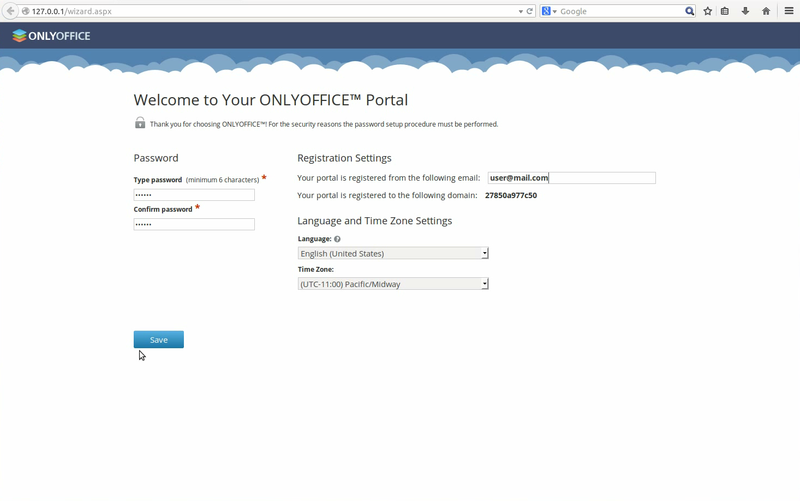 Once ONLYOFFICE is installed, you may need to customize and manage it so that it fitted your needs. All the necessary instructions can be found on the ONLYOFFICE official website. Tip 5. To install ONLYOFFICE using the graphical user interface, download the installation file from SourceForge. Tip 6. If you are looking for simplest and more secure way to install ONLYOFFICE, use the Docker service. Think you for this tutorial ! I have a question, I wanted to install it on a subdomain.But the way you install it that will be accessible from any where (maybe I am wrong). I am hosting websites I would like to have it in couple of domain but with different content.ex: I have "mydomain.com" for the main website I would like this : dep1.mydomain.com and dep2.mydomain.com having accessI do not want any people by putting the port to acces to it. Is it possible ? Or maybe I have to ask them that question. I do beleive that it is possible to have couple of different dep on the same SGBD, just by making an admin for eachThinks. i already installed onlyoffice but "chmod +x /var/www/onlyoffice/configure.sh/var/www/onlyoffice/configure.sh" is no such file or directory. can you help? please..